The Smithsonian Center for Folklife and Cultural Heritage and Cricket Media, an education media company and global learning network, recently invited kids from around the world to identify and interview people who exemplify important traditions in their communities, then asked them to document and present their stories. 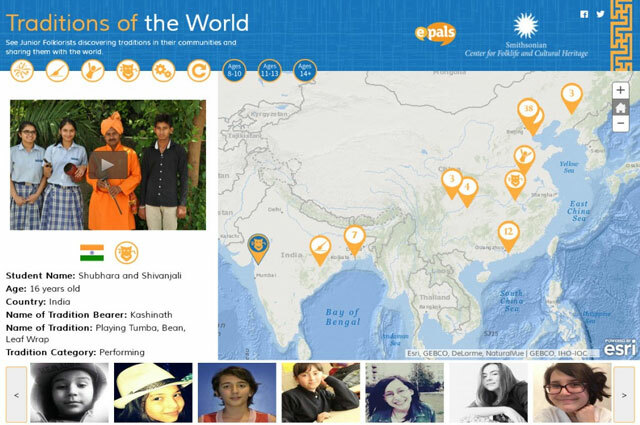 Cricket Media and Blue Raster created the Traditions of the World story map using ArcGIS Online, highlighting the top video submissions from kids ages 8-18 from around the world. The result is an interactive virtual field trip with lively hosts that include a 9 year old boy from West Bengal India showing traditional saris being hand woven and students in China documenting everything from dumpling making to martial arts. The challenge was launched in coordination with the Smithsonian Center’s annual June-July Washington D.C.-based Folklife Festival and extends the folklife experience to millions of students globally. The Story Map has since been removed from the web.